Erythropoietin (EPO) is a naturally occurring protein hormone. EPO is produced in the body by the kidneys and is used to regulate red blood cell production. Patients suffering from anemia or chronic renal failure are legally allowed to use this form medically, it is proven that this product effectively stimulates and maintains erythropoiesis in a large percentage of patients treated. The efficiency of this drug quickly made it a ready replacement for older and less effective therapies such as Anadrol (oxymetholone) 50 or Nandrolone Decanoate. The biological activity or rHuEPO is indistinguishable from that of human erythropoietin. Some athletes have decided to take advantage of this substance as well. Nowadays, all EPO on the market is Recombinant human erythropoietin (rHuEPO). There are five erythropoiesis-stimulating agents currently available: epoetin-alpha, epoetin-beta, epoetin-omega, epoetin-delta, and darbepoetin-alpha. Both, endogenous and recombinant EPO makes body producing more red blood cells, thus increasing oxygen transmission from lungs to all systems of the body, including muscles, which results in increased stamina in performance sports. In the medicine it cures symptoms of anemia including cancer-caused. EPO has put a whole new spin on blood doping. No need for messy transfusions, just shoot up with EPO to increase your circulating erythrocyte mass. EPO is actually not that dangerous a product to use if it is used PROPERLY, and one’s blood is monitored. With proper blood work, and boosting to a safe level (typically max of 53-54% for elite level endurance athlete, while it’s around 40% for “normal” people) there shouldn’t be major complications. But do not cross that line. Endurance athletes are highly attracted to EPO for the effect it has on red blood cell production. It is no secret that the practice of “blood doping” is popular with endurance sports. This procedure involves removing and storing a quantity of blood from your body, to be later replaced. By adding this stored blood before an event (by then the body has restored the lost blood volume), the athlete has a much greater number of red blood cells. The blood can therefore transport oxygen more efficiently, and the athlete is given a noticeable endurance boost. This has no doubt been the difference between winning and losing for many individuals. This procedure, however, carries with it a great number of risks. Blood is a difficult thing to store and administer, not to mention the problems that can occur with the extra cell volume. Part of these risks (besides cells volume problem) are reduced with EPO, a drug that basically equates to “chemical blood doping”. Some studies have shown that athletes have had an 9% increase in VO2 max, 7% increase in power output, and a 5% decrease in max heart rate. While the benefits of using erythropoietin are unquestionable, there are serious side affects that an athlete needs to consider. After injection, the blood has a higher concentration of red blood cells and a thicker viscosity. This may lead to thromboembolic events that could be fatal. I.e. if you dope more than necessary, thrombs may stop the bloodstream during the exercises and sportsmen dies. There are serious suspicions against EPO for the deaths of some top cyclists during 80s and 90s. Seizures and hypertension are also demonstrated in those athletes who are blood doping. Most athletic federations have banned this practice and a hemoglobin limit of 18.5 g/dL has been implemented. In a study done by Audran, nine well-trained athletes (seven males, two females) received a 50U/kg dosage of rhEPO daily for 26 days. Tested were four triathletes, two cyclists, one rower, one swimmer, and one handball player, averaging an age of 24 years old and weight of 73kg. During treatment, significant increases in reticulocyte, EPO and sTfr concentrations and sTfr/serum protein ratios were seen by day ten, whereas hemoglobin and hematocrit levels did not clearly increase until day 14. From the results after the last rhEPO injection, reticulocyte, hemoglobin and sTfr concentrations remained above baseline values for seven days; and hematocrit levels remained above baseline up to 14 days; and EPO levels stayed above baseline for two days, as was expected due to its short half-life. Physiological tests were also done to measure the effect of rhEPO. On average, VO2max increased by 5ml/min/kg, and maximum heart rate lowered by 9 beats/min after the treatment period. In simple words – athlete can take advantage on the EPO injections effect for up to two weeks, but peak level is reached just after the last injection. Weekly dosage varies 50-300 IU per kilogram of body weight with some iron supplementation. By this guideline a 176 lb (80 kgs) athlete would take a maximum of 4000 U per injection. This would be done in the days/weeks prior to a competition, the peak effect hopefully reached near the day of the event. Sportsmen starts feeling results after two weeks of usage (hematocrit level increases 3-4%). Most of specialists agree that one should not use erythropoietin for more than six weeks! Also one can use this formula: 20-30 IU per kg for every shot (three shots a week). Conservative approach is 4500 IU / week (3 shots x 1500 IU) with 3000 IU supportive dosage (3 shots x 1000 IU).The higher dosage is – the more effect and more risks you gain. Anyway, it depends on the personal characteristics, base levels, target goals desired. Blood tests recommended if you’re toying with higher doses. In general, greater dosages of rhEPO induce a quicker response of increased erythropoiesis than lower dosages, however, they are more likely to be detectable by doping tests. If athlete is not in a rush, it’s better to make three shots a week – peak form will be achieved anyway. 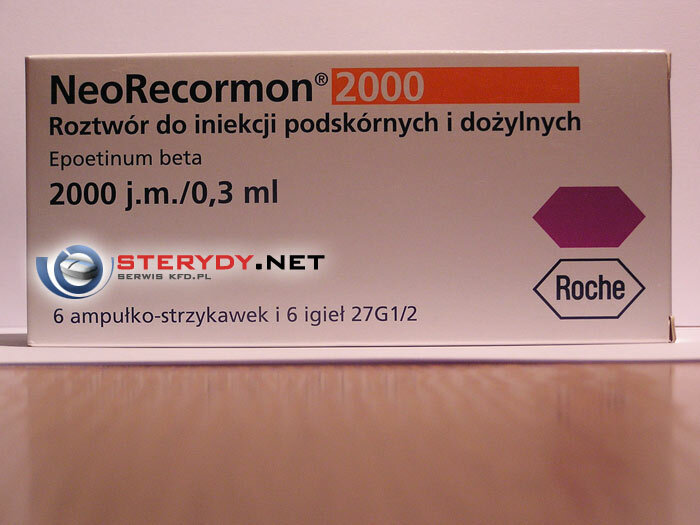 EPO is sold in recombinant form (rhEPO) for injection. It usually is packaged as a lyophilized (freeze dried) powder that is reconstituted with sterile water before injection. Injections preferably to be made by thin needle with insulin syringes. Erythropoietin is to be given subcutaneously (between the skin and muscle – into the body fat) or intravenously. These two paths of administration have greatly different effects on the blood level of the drug. When given as an IV injection, peak blood levels of the drug are reached very quickly. The half-life is also short, approximately 4 or 5 hours long. When administered “SubQ”, the drug will take 12 to 18 hours to reach a peak level. Given an equal dose, this concentration will also be much lower than the intravenous method. The half-life also greatly extended, estimated to now be approximately 24 hours. SubQ injections are to be made in the outer upper arms, front of thighs, or abdomen. If you are injecting in the abdomen, just be sure to not be too close to the umbilicus. If you’re doing some anticoagulant as well, you could still give EPO in the abdo, just not in the same site. EPO injections often burns because you inject it cold. If you can roll it between your hands a couple of minutes or let it get to room temperature, it is painless as an insulin injection. Some endurance athletes may use both, EPO and winstrol during preparation for the contest, however, we have no information on the possible synergetic effects, and, most important, side effects. If anyone emails us his own winstrol + Erythropoietin (EPO) experience – this would be appreciated. In practice, it is common for rhEPO injections to be accompanied with intravenous injections or oral supplementation of iron (orals are more effective). However, Iron overload may occur and lead to symptoms similar to those of genetic hemochromatosis. Folic acid and Vitamins also advisable. Here’s possible EPO stack (weekly dosage! ): 100 IU/kg of rhEPO; 25mg of iron, 25mg of folic acid; 2500mcg of Vitamin B12, lenght of treatment 10-20 days, 2-3 shots per week. There are problems in directly testing for rhEPO in blood or urine due to its short half-life between 4 and 13 hours, and similar structure to endogenous erythropoietin (EPO). Detection of rhEPO may require an indirect approach that reveals physiological changes in blood samples. Unfortunately, testing technology has now notably improved. There are now accurate urine and blood tests that can detect the differences between normal and synthetic EPO. This test became the standard one and was the sole means to detect for EPO use in the 2004 Athens Olympic Games. The reliability of this test helps explain the cascade of athletes who have been caught. Therefore, at the present, athlete must consider “window” – just like with steroid use – when chances to detect falls down, but effect is still considerable. I.e. at the moment of competition, EPO should move out of the system but red blood cells should be still in. There are short-acting and long-acting types of EPO (we offer short-acting version). It’s better to take smaller doses on regular basis than single big injection. This reduces the possibility of detection by the urine test by lowering the percent of basic isoforms in the urine. A smaller dose means a drug tester might only have 12 hours to detect the last injection, and given the fact that drug tests aren’t usually carried out in the middle of the night, this leaves only a very small window open for being tested “positive”. Taking small, regular doses also simulates the body’s natural physiology more closely than a super-sized dose, which means that it could even get under the radar for the longer term blood testing. So 2000 IU three times a week is better than 6000 IU once a week. Detection time varies 12-48 hours according to different sources (in fact you might be in danger even longer with high dosages). Most likely it also highly depends on the dosage and cycle schedule. Fortunately, rhEPO has a short half-life and is similar in structure to endogenous EPO. These two factors make blood and urine detection difficult since electrophoretic techniques must be done within a limited timeframe in order to be able to distinguish between the two forms of erythropoietin. In order to gain the physiological effects of rhEPO, athletes need to continue its use until a late stage of preparation for an event. A test for increased erythropoiesis in the two to six weeks before competition would have a high likelihood of detecting rhEPO abuse – they can catch you during preparation. Detection of rhEPO poses many problems. As already stated earlier, rhEPO has a short half-life and is similar in structure to endogenous EPO. These two factors make blood and urine detection difficult since electrophoretic techniques must be done within a limited timeframe in order to be able to distinguish between the two forms of erythropoietin. It is possible to detect rhEPO in urine and blood serum as was done by Wide. He tested 15 healthy, moderately-trained men between the ages of 19 to 40 years old. At a fairly low dosage, 20U/kg three times a week for eight weeks, rhEPO was accurately detected in blood up to two days after the last injection; and in urine one day after the last injection. From the data, sensitivity of the test decreases to fifty percent in detecting rhEPO in blood or urine after three days from the last injection. Detection was done by separating rhEPO from EPO by charge using electrophoresis. (Wide 1574-5) Endogenous EPO is slightly more acidic than rhEPO (Lasne 635). After one week, this method of detection fails in detecting any rhEPO. Although this technique is accurate, it is only accurate for a short period of time. It is possible to remove EPO from the urine by putting protease on their hands, then urinating on their fingers. Only a small amount of protease is needed to break down all EPO in the urine. This theory might explain why so relatively few riders have delivered a positive EPO test last years compared to how many riders have been caught with an enhanced hematocrit. Unfortunately counter-tests are being researched. Just like with steroids – you should use it wisely. Inappropriate usage might be dangerous if not fatal, but proper one eliminates all the risks or lowers it to the affordable level. Nowadays, we gained enough experience and stats to know how to avoid the problems. EPO use is especially dangerous to athletes who exercise over prolonged periods. A well-conditioned endurance athlete is more dehydration resistant than a sedentary individual. The body accomplishes this by several methods, but one key component is to ‘hold on’ to more water at rest. Circulating whole blood is one location in which this occurs and, thus, can function as a water reservoir. During demanding exercise, as fluid losses mount, water is shifted out of the blood stream (hematocrit rises). If one is already starting with an artificially elevated hematocrit then you can begin to see the problem – it is a short trip to the critical ‘sludge zone’ (so drink enough liquids and don’t forget about aspirin!). Additional dangers of EPO include sudden death during sleep, which has killed approximately 18 pro cyclists in the past fifteen years, and the development of antibodies directed against EPO. In this later circumstance the individual develops anemia as a result of the body’s reaction against repeated EPO injections (so do not use for longer than 6 weeks! and do not use through the whole year, do it 1-2 times before the most important competitions). There are also a number of side effects associated with general use of this substance. Most notable, blood pressure can begin to rise as cell volume changes. This can reach the point of headaches and high blood pressure, obviously an unwanted effect. Additionally, flu-like symptoms, aching bones, chills and injection site irritations are also possible. Since athletes are not using this product for a medical condition, a strong incidence of side effects should be an indicator to discontinue using the drug. Clearly one should not wish to compromise their health for an athletic push. Does EPO contain blood fractions? While erythropoietin itself is not a blood product, some brands of the synthetic form do have a very small amount of a blood fraction added to them. The epoetin-alfa formulation (Epogen®, Procrit®) contains 2.5 mg human serum albumin. The albumin first prevents the pharmaceutical from sticking to the vial, and then acts as a carrier molecule to help the EPO remain in the bloodstream until it reaches its destination at the bone marrow. Stimulates RBC (red blood cells) production. T max is 5 to 24 hours (subcutaneous). Elimination half-life is approximately 4 to 13 hours (IV). Elderly: Pharmacokinetic data indicate no apparent difference in half-life among adult patients older or younger than 65 yr of age. Children: Pharmacokinetic profile in children and adolescents is similar to that of adults. Limited data are available for neonates. What alternatives to EPO are there? EPO is the standard of care for many patients with anemia of end-stage renal disease (ESRD). For certain patients, such as those who produce antibodies to erythropoietin, who develop pure red cell aplasia (PRCA), or who develop arterial hypertension, treatment with any form of EPO is not appropriate. However, these patients may be given androgens (hormones) that have been shown to stimulate bone marrow function. Of course, as with any medicine, these substances are not without side effects of their own. One of the most widely used of these is nandrolone decanoate (NAND), which seems to be better tolerated with less dramatic side effects than other androgenics. In some cases, intravenous iron without EPO appears to be as effective in correcting anemia. Below we’ll provide some information for medical EPO (erythropoietin) usage. Please use this for information purposes only! We can give advices in sport, but not with life-threatening deceases. We do not to harm anybody by improper advice, make sure to contact your GP before usage!!! So, where it is used in medicine? Treatment of anemia related to chronic renal failure (CRF), anemia related to zidovudine therapy in HIV-infected patients, and anemia due to chemotherapy in patients with metastatic non-myeloid malignancies; reduction of allergenic blood transfusions in surgery patients. Red cell production : Its use is increasing in preoperative and postoperative settings to stimulate the surgical patient’s red cell production. Blood transfusion alternative : In many clinical settings EPO may be used to reduce or even eliminate the need for blood transfusion. It can be used in neonates for treatment of anemia of prematurity. Various clinical applications for EPO and a succinct historical perspective of erythropoietin are presented and discussed in research by T. Ng, et al. (2003). Other potential benefits : There is evidence to show that, in addition to boosting RBC production, EPO may have a positive effect on platelet and leukocyte production. EPO has also demonstrated a tissue-protective ability, of particular benefit in chronic heart failure and neurological damage, and may benefit surgical and burn patients through its wound healing properties. Unlabeled Uses: Anemia associated with critically ill patients, CHF, chronic disease (eg, rheumatoid arthritis), postpartum anemia, sickle cell disease, thalassemia, multiple myeloma, Jehovah’s witnesses (due to prohibition of human blood transfusion), radiation treatment, epidermolysis bullosa, porphyria, for athletic enhancement (yes, that’s our case! ), sexual dysfunction, transfusion iron overload, uremic pruritus. The optimal dosing regimen has yet to be defined. The authors of some studies favor lower doses such as 75 to 150 IU for every kilogram (u/kg) of body weight given daily or every other day. Others found that 600 u/kg given once a week was more effective. Nevertheless, the most commonly ordered dose is likely to be 300 u/kg three or four times a week. Thus, for a 70 kg patient, 60,000 IU per week would be ordered. Subcutaneous 3 times/wk dosing: 150 units/kg 3 times/wk. Reduce the dose by 25% when Hgb reaches a level needed to avoid transfusion or increases more than 1 g/dL in any 2-wk period. Withhold the dose when Hgb exceeds a level needed to avoid transfusion and restart at 25% below the previous dose when the Hgb approaches a level where transfusions may be required. Increase the dosage to 300 units/kg 3 times/wk if the response is not satisfactory after 4 wk to achieve and maintain the lowest Hgb levels sufficient to avoid the need for RBC transfusion and not to exceed the upper safety limit of 12 g/dL. Discontinue if after 8 wk there is no response as measured by Hgb levels or if transfusions are still required. Weekly dosing: 40,000 units/wk. Reduce the dose by 25% when the Hgb reaches a level needed to avoid transfusion or increases more than 1 g/dL in any 2-wk period. Withhold the dose if the Hgb exceeds a level needed to avoid transfusion and restart at 25% below the previous dose when the Hgb approaches a level where transfusion may be required. Increase the dosage to 60,000 units/wk if the response is not satisfactory (no increase in Hgb by at least 1 g/dL after 4 wk of therapy, in the absence of an RBC transfusion) to achieve and maintain the lowest Hgb levels sufficient to avoid the need for RBC transfusion and not to exceed the upper safety limit of 12 g/dL. Discontinue if after 8 wk there is no response as measured by Hgb levels or if transfusions are still required. IV Weekly dosing: 600 units/kg/wk (max, 40,000 units/wk). Reduce the dose by 25% when the Hgb reaches a level needed to avoid transfusion or increases more than 1 g/dL in any 2-wk period. Withhold the dose if the Hgb exceeds a level needed to avoid transfusion and restart at 25% below the previous dose when the Hgb approaches a level where transfusion may be required. Increase the dosage to 900 units/kg/wk (max, 60,000 units/wk) if the response is not satisfactory (no increase in Hgb by at least 1 g/dL after 4 wk of therapy, in the absence of a RBC transfusion) to achieve and maintain the lowest Hgb levels sufficient to avoid the need for RBC transfusion and not to exceed the upper safety limit of 12 g/dL. Discontinue if after 8 wk there is no response as measured by Hgb levels or if transfusions are still required. IV / Subcutaneous Individually titrate to achieve and maintain Hgb levels between 10 and 12 g/dL. Increases in dose should not be made more often than once monthly. Start with 50 to 100 units/kg 3 times/wk. Increase the dose by 25% if the Hgb is less than 10 g/dL and has not increased by 1 g/dL after 4 wk of therapy or if the Hgb decreases below 10 g/dL. Reduce the dose by 25% when the Hgb approaches 12 g/dL or the Hgb increases by more then 1 g/dL in any 2-wk period. If the Hgb continues to increase, temporarily withhold the dose until the Hgb begins to decrease, then reinitiate treatment at a dose approximately 25% below the previous dose. IV / Subcutaneous Individually titrate to achieve and maintain Hgb levels between 10 and 12 g/dL. Increases in dose should not be made more often than once monthly. Start with 50 units/kg 3 times/wk. Increase the dose by 25% if the Hgb is less than 10 g/dL and has not increased by 1 g/dL after 4 wk of therapy or if the Hgb decreases below 10 g/dL. Reduce the dose by 25% if Hgb approaches 12 g/dL or the Hgb increases by more then 1 g/dL in any 2-wk period. If the Hgb continues to increase, temporarily withhold the dose until the Hgb begins to decrease, then reinitiate treatment at a dose approximately 25% below the previous dose. Subcutaneous Prior to starting treatment, obtain Hgb to establish that it is more than 10 to less than 13 g/dL. Usual dosage: 300 units/kg/day for 10 days before surgery, on the day of surgery, and for 4 days after surgery. Alternative dose schedule: Subcutaneous 600 units/kg in once-weekly doses (21, 14, and 7 days before surgery), plus a fourth dose on the day of surgery. IV / Subcutaneous Prior to starting therapy, determine the endogenous serum erythropoietin level. Evidence suggests that patients receiving zidovudine with endogenous serum erythropoietin levels more than 500 milliunits/mL are unlikely to respond to epoetin alfa therapy. Titrate the epoetin alfa dosage to achieve and maintain the lowest Hgb level sufficient to avoid the need for blood transfusion and not to exceed the upper safety limit of 12 g/dL. For patients with serum erythropoietin levels of 500 milliunits/mL or less who are receiving zidovudine 4,200 mg/wk or less, the recommended starting dosage is epoetin alfa 100 units/kg 3 times/wk for 8 wk. Monitor the Hgb weekly. If the response is not satisfactory in terms of reducing transfusion requirement or increasing Hgb after 8 wk of therapy, the dosage of epoetin alfa can be increased by 50 to 100 units/kg 3 times/wk. Thereafter, evaluate the response every 4 to 8 wk and adjust the dose accordingly, in 50 to 100 units/kg increments 3 times/wk, to a dosage of epoetin alfa 300 units/kg 3 times/wk. After attaining the desired response, titrate the epoetin alfa dose to maintain the response. If the Hgb exceeds the upper safety limit of 12 g/dL, stop until the Hgb drops below 11 g/dL. Reduce by 25% when treatment is resumed and titrated to maintain the desired Hgb. For subcutaneous or IV bolus administration only. Not for intradermal, IM, or intra-arterial administration. IV route recommended for patients on hemodialysis. Do not shake or vigorously agitate vial. Prolonged vigorous shaking may denature the glycoprotein, rendering it biologically inactive. Do not administer if particulate matter, cloudiness, or discoloration is noted. If transferring saturation is less than 20%, give supplemental iron. IV dose may be administered into venous line at end of dialysis procedure to obviate need for additional venous access. Single-dose vials contain no preservative. Use only 1 dose/vial. Do not reenter vial. Discard any unused portion. Do not combine unused portions or save unused portions for later use. Do not administer in conjunction with other drug solutions. However, at time of subcutaneous administration, single-use vials may be admixed in a syringe with bacteriostatic sodium chloride 0.9% with benzyl alcohol 0.9% at a 1:1 ratio. Multidose vials contain benzyl alcohol and admixing is not necessary. Adjust dose to achieve and maintain lowest Hgb level sufficient to avoid the need for RBC transfusion and not to exceed 12 g/dL. Storage/Stability: Store vials in refrigerator (36° to 46°F). Do not freeze or shake. Protect from light. Multidose vials may be stored in refrigerator at 36° to 46°F for up to 21 days after initial entry.